So I saw The Hunger Games … and to be brutally honest, I did not like the movie … not even one little bit – but not because I read the book(s) and was disappointed in Hollywood’s rendition … and not because I didn’t like the chosen actors … or because I couldn’t handle the thought of children killing children (I mean come on, I watch the news). Nor was it because I disliked the concept (actually, I find the whole idea behind the film quite beguiling – but then again I am a huge Aldous Huxley fan and to this day think that Brave New World is the most brilliant, albeit disturbing, stories ever written). Remember, it wasn’t all that long ago (not in the whole concept of time) that humans used to be thoroughly entertained whilst watching gladiators battle to the death and yet some of those same European descendants found the Indian’s scalping of “innocent” white man savage. And let us not forget jousting or hate crimes or honor killings (WTF is up with that!!! Where is the honor in hunting and killing your own flesh and blood?). The list goes on … does it not? And The Hunger Games isn’t that far removed – if removed at all – from the barbaric past, let alone future that is, God forbid, ours. The beginning of the movie looked more like a Nazi controlled world than the promising future that so many of us picture for the human race. 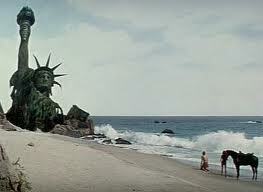 And while I will never forget watching Charlton Heston’s face when he witnessed broken Lady Liberty cast away amongst all the other beach trash in whatever fictional year that was, I cannot help but be hopeful that our imminent potential is more optimistic than what was portrayed in The Planet of the Apes let alone The Hunger Games. Anyway … bear in mind that this is no way was intended to be a “review” … I’m simply not in that business. The Hunger Games was a good movie … and the acting and characters and storyline worked well … BUT, the concept of human sacrifice and its contemporary relevance did not rest well with my soul, and that is where this post developed. Have you seen the move? Read the book(s)? What do you think?? Previous Ever asked a five year old to multitask?? I read the books, but I just took them for what they are…books! Perhaps the movie might change my view, but I can't imagine a world like that. I have no idea what the hunger game story is about! I think I prefer to read the book instead. I still haven't seen the movie, actually have postponed it for a while now, thinking that this would be just another hollywood homicide of a popular book. But with your thoughts I am decided to go. Returning your visit and looking forward to follow and continue reading your posts. Interesting blog and well written! Thanks for stopping by the Ease of Freeze! Didn't read the books. Really liked movie. A bit slow at first but so intense as it progressed. Disturbing yes but also quite realistic. There is a very yogic element to it if you have ever read the Baghavad Gita or know anything about it…. I never thought of it like that…but you're so right. I saw the movie, and liked it for what it was. I enjoyed the books too…although I think that it's not really a YA series…it's ABOUT young adults, but I think it's too mature for them. Good to hear your opinion Shauna–the show has gotten so much pub lately. I have not read the book nor planned to see the movie.